10. Men, Women and Molecules: IV. Where Shall I Look for Her? The impetus for commissioning the collection of pieces on this recording was our desire to create a program uniquely suited to us, both musically and thematically. We chose four composers whose work we greatly admire to write these new compositions and arrangements, and in working with each of them, we sought to bring about works that suit Gioia's vocal style and play to her strengths as an actor, with accompaniments that are musically superb and that feature the guitar as an equal member of the duo. The texts of the new compositions have particular resonance for us: David Leisner’s "Eve’s Diary" uses the writing of Mark Twain, a writer we both grew up loving, while Frank Wallace’s "Men, Women and Molecules" sets some of the wonderful science-based poems of the multi-talented (and Nobel Prize–winning) chemist Roald Hoffmann. For the set of Broadway arrangements by Clarice Assad, we chose songs with beautiful, character-based texts and musical textures well-suited to the guitar. For João Luiz’s set of arrangements, we started by selecting with him some of the great Jobim melodies, knowing that he would add rich, harmonically interesting and rhythmically brilliant guitar accompaniments. 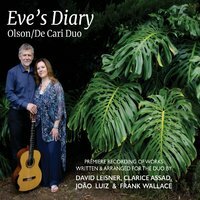 When guitarist John Olson and soprano Gioia De Cari commissioned me to write a piece for them, I envisioned writing something theatrical that might especially suit Gioia, who is both a singer and an actress. Eventually, I thought of Mark Twain. The great American writer and humorist of substance wrote a short, little-known book called "The Diary of Adam and Eve," which is, of course, about the first days of human life on this earth, in Twain’s witty, but touching, take on the Bible story. Adam and Eve each write diary entries. I chose several passages from Eve’s diary that convey the sense of constant wonder that she felt because absolutely everything in her world was new. Setting prose, rather than poetry, is a challenge for a composer because it has neither the innate rhythm nor the lyricism of poetry. On some intuitive level, this challenge led me to a process that allowed the music to evolve mostly from the guitar part. Whereas normally the vocal melody might emerge first, motivated by the text and with the accompaniment then added for support, here the guitar part was the prime mover. A good example of this is the last song, which is a passacaglia played by the guitar, providing the ground over which the vocal line can soar. Eve’s Diary was composed in 2015. John and Gioia conceived a project to commission songs written on “science” texts. Curious, I talked with them about what they were looking for. We started a dialogue, and a search for texts that had any connection to the world of science began. After writing three of the songs, Roald sent me his latest play, "Something That Belongs to You." The play juxtaposes scenes from 1943 and 1992, when the daughter of his family’s protectors attempts to return his mother’s wedding ring. The occasion forces him and his mother to confront and share with their family the terrible truths and still-intense feelings of betrayal, hate, and loss, as well as the irony of the ring. As a dramatic work and not a biography, the play changes some of the relationships and events of the period, but Roald notes that it remains true to the essentials of what happened to him. Reading this play confirmed my musical and poetic choices: Roald came from a loving family that had been ripped apart by the tide of hate in the 1940s. But he was young; the images became muted but haunted him, and his successes in science, academia, and love, here in America, reconfirmed his solid commitment to life. The six-song cycle begins with musical references to Roald’s Eastern European roots, minor scales with augmented seconds and compound meters. It progresses into lighter jazz harmonies, symbolic of his new homeland, in “Where Shall I Look for Her?” and uses the image and music of “Amazing Grace,” as sung by Judy Collins. The major seventh interval plays an important role throughout the cycle, both as a clashing dissonance, and as part of sentimental jazz chords. “Next Slide, Please” is a light-hearted jab at the academic world of science, but it proved the most daunting to set. The dissonances and awkward melodies are intended as a technical or scientifically-calculated counterpoint to, rather than a direct expression of, the inherent humor of the poem. The music of Brazilian composer Antônio Carlos Jobim has been featured for many decades in the repertoire of leading jazz singers and instrumentalists all over the world, making the composer one of the most recorded and well-known artists from Brazil. Mostly associated with the bossa nova movement, which brought him international recognition, Tom Jobim also wrote music for movies and plays, music for orchestra, and a few instrumental pieces for the piano,. But his work is centered on the song, with approximately 250 titles. When asked by John and Gioia to create a small cycle of songs by Jobim for voice and guitar, I was presented with a challenge: How to write an interesting guitar part, avoiding being trapped by the bossa nova “right hand pattern” so infused in Jobim’s songs. Another task was to make the guitar and voice to interact equally, creating an almost art song–like frame, as the guitar and vocal lines were both vital parts of the composition, as opposed to the accompanied melody approach so common in interpretations of Jobim’s songs. The complexity of the guitar part is at the service of the music and aims to emphasize the text. In some songs, I took the liberty to slightly change the rhythms, as well as the meter, as a way of making some words more clear, while preserving the original character of the music. To create more unity between the guitar and the voice, I treated the vocal line more percussively when called for, referencing certain instruments and rhythmic patterns that are found in pre-bossa nova genres like samba (”One-Note Samba”), jongo (”Água de Beber”), and toada (”Correnteza”), which almost certainly influenced Jobim. I was thrilled with the invitation to write arrangements for John and Gioia. The pieces, coming from a variety of well-known theatrical settings, were a delightful challenge to embrace, because it meant disconnecting them from their original ensemble sizes and lush orchestrations, restructuring entire compositions to be molded into something palpably intimate. Still, as minimalist as such miniatures are bound to become, there is vast room for exploration: Delicate colors, dynamic range and fine nuances are sometimes lost within the thickness and power of a sizable ensemble. With these ideas in mind — and careful preoccupation about maintaining the integrity of all the works — I hope to have achieved a well-balanced structure for both musicians to freely express themselves, while adding a fresh outlook to such revered themes from the musical theater songbook.